Big TY for NCDA. 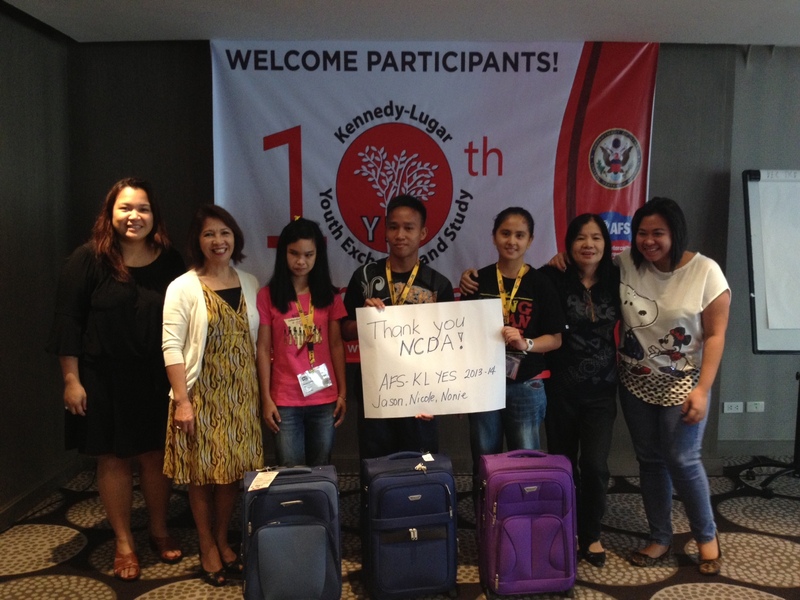 AFS officers join three AFS exchange students to thank program partner NCDA for the “maleta” (suitcase) send-off, prior to their U.S. flight to start their AFS year. From left, Ms. Tisha Lee Eduave, Programs Manager, AFS Intercultural Programs (IPP) Ms. Beth Eduave, Volunteer & Charter Development Manager, Nonie Lumbis of Camarines Sur National High School now in Winton Woods High School, Cincinnati Ohio, Jayson Peralta of Ramon National High School, Isabela now in John Glen High school, Michigan, and Nicole Linsangan of Isabela School for the Deaf, now in Marshal High School, San Antonio Texas, NCDA-TCD Chief Nelia de Jesus and AFS-IPP staff Danette “Dee”Rico.